In the current age of modern action series like Heroes, its hard to believe that a simple show like Little House on the Prairie was once a mainstay of the NBC Monday night schedule. The series ran for nine successful seasons on the peacock network and starred Michael Landon, Karen Grassle, Melissa Gilbert, Melissa Sue Anderson and Lindsay and Sidney Greenbush. Landon was a co-executive producer of the series and directed many of the episodes. Based loosely on the books by best-selling author Laura Ingalls Wilder (1867-1957), the series told the story of the pioneer Ingalls family and friends as they mad thie life in 1800s frontier Minnesota. One of the joys of the series was in watching young Melissa Gilbert as Laura grow through her early childhood into a mature teacher and mother. 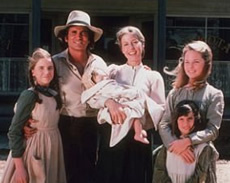 Now, 24 years after the series went off the air, Gilbert is returning to Little House on the Prairie. Gilbert and Patrick Swayze have been signed to appear in a musical version of Little House on the Prairie. The staged reading of the new musical called Prairie, based on the original books by Ingalls Wilder, will feature Gilbert and Swayze as Ma and Pa Ingalls. Beth Henley, who won the Pulitzer for writing Crimes of the Heart, wrote the play’s book. Donna DiNovelli wrote the lyrics and Oscar-winner Rachel Portman (Emma) composed the music. International director Francesca Zambello will direct the workshop. Zambello is set to direct a stage version of Disney’s The Little Mermaid in the Fall. The staged readings will take place April 16-17 in Manhattan. Though the readings will be closed to the public, producers are hoping to mount a national tour for next Spring. If all goes according to plan, it could land on a New York stage after that. Stay tuned! Wow that show takes me back to my childhood – Shame Mr Swayze has departed after this article was written. Just watched the last show again on the HMC. Always breaks me up! I love the show it is one of my favorites! Laura Ingalls Wilder is one of my heroes. It is very amazing and outstanding to cross a river in a covered wagon and to fly to California in an airplane. The has many wonderful messages and wouldn’t be as popular without the Olesons’. we just finished watching the final video of this show and it was very well done. Except the last view of all those rabbits running around was kind of hard to belivev as they would have taken them for food while traveling. But we did like how it ended – which is not really like the book. There is also a rumor out there that Michael Landon didn’t want to have to do any reunion shows. So he blew up the town to avoid the possibility! Besides having to leave it as they found it, Landon didn’t want the houses redressed and used for other series too, so that’s why they blew it up. True. The townspeople were swindled out of their land and the buyer figured he’d get the houses for free. The townspeople blew up the houses so he couldn’t have them. It was a pretty dramatic way to end the series. In reality, the production company had to leave the land as they’d found it so they had to destroy the houses for real anyway. Pretty clever how they incorporated that into the series ending. I would like to know why they blew up the town in the last show of Little House on the Prairie. I seem to remember that someone had purchased the land the town was on, but am unsure, and my daughter and I were discussing it and would like to know. Thanks.